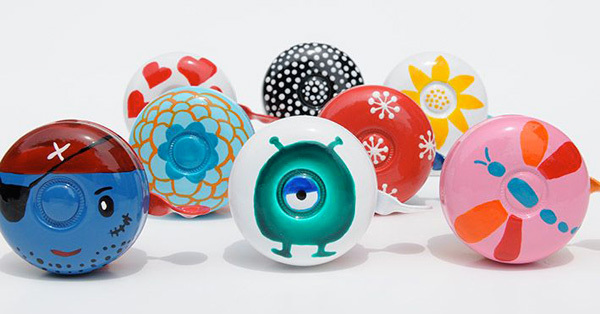 They’re more than your average bike bell that’s for sure – we love these fancy bike bell designs from Beep Bicycle Bells! Why settle for the boring bell that comes with your kid’s bike when they can have one that really shows their personality!? Beep Bike Bells are more than a accessory – they’re a piece of artwork for the handlebars of any bike riding enthusiast. Made completely from steel (yes, no sneaky plastic parts) the bell is beautifully hand painted using non-toxic paints, then cured and baked to become weather resistant. With an amazing amount of designs available from plain solid colour, duo colours to original hand painted designs of Eyeball, Polka Dots and Pirate, to name just a few. Beep Bike Bells are easy to install using a mounted clasp and bracket to fit most bikes. The fun doesn’t stop there though as Beep Bike Bells have phenomenal packaging – your glitzy bike bell of choice is packaged in an awesome ice-cream cup! Beep Bike Bells are $24 each and are available from Scallyoop.